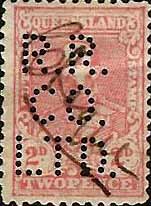 User: E H Rich & Co Ltd.
Revenue Use: KEDVII 1901 issue 2d. Background: E Rich and Company Limited were formed in Brisbane in the 1890’s and they were a trading company importing and on selling goods. Their interests may have extended into port facilities and coastal shipping as there Chairman was at one time, Benjiman Macdonald, who was instrumental in the development of coastal shipping in Queensland and later formed the shipping company Macdonald, Hamilton and Co, who were agents for P&O until 1960. In 1924 E Rich took over the business of the Queensland Agency Company but this is about the time of the end of the use of the RICH device so this may have been a contributing factor to the discontinuance of the perforator. Device: The device is most likely a single head device and it is found in the characteristic variety of positions and angles of such devices. 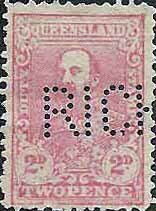 Approval to perforate stamps was sought and approved in February 1902 and the RICH pattern is found on revenue and postage stamps of Queensland and later postage stamps of Australia (from 1913) over the period 1902 until at least 1923. In late usage in the early 1920’s the pins at the bottom of the spine of the R are absent or blind indicating that the device was not in good working condition. In 'I' of 'R I' the 'I' is to the right of the 'o' in Co on line two. User: Royal Insurance Co Ltd.
KEDVII 1908 issue 1d dated 1913, 6d, 1/-, 2/-, 3/-, 10/-, 20/-. KGV 1920 issue 2d, 1/-, 2/- dated 1924. 1930 issue 2d, 4d, 6d, 8d, 1/-. 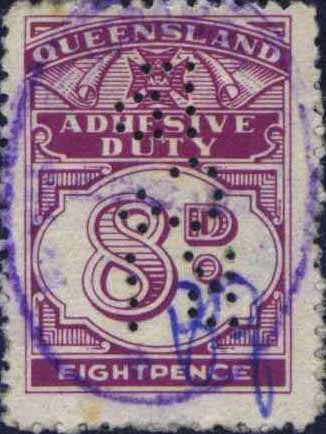 KEDVII 1908 issue 1d R2, 6d R4, 1/- R4, 2/- R4, 3/- R4, 10/- R4, 20/- R4. KGV 1920 issue 2d R4, 1/- R4, 2/- R4. 1930 issue 2d R2, 4d R4, 6d R4, 8d R4, 1/- R4. 1966 2c R3, 10c R3, 25c R4. Background: The Royal Insurance Company was established in Liverpool in May 1845 and expanded quickly into overseas markets establishing offices in Australia, Canada, Singapore, and South America by the 1850’s and later the US. By the 1860’s Royal had 10 offices in Australia and it continued to grow through mergers at home and abroad. In 1919 it acquired the rival Liverpool & London and Globe Insurance Company in what was, at the time the largest merger in British Insurance history. This merger was a trend that was to continue across the industry through the 20th century culminating in Royals merger with Sun Alliance, itself a product of mergers between the Sun, Alliance, London and later Phoenix Insurance companies. The resulting company Royal Sun Alliance was formed in 1996 and was later (2008) rebadged as RSA Insurance Group and is headquartered in London. As part of these changes the companies activities in Australia and New Zealand are restructured under the Promina Brand and the General Insurance arm is renamed Vero. Device: In 1912 Royal Insurance purchased a number of near identical devices for their offices across Australia including Melbourne, Sydney, Newcastle, Brisbane (this device), Adelaide and Perth. From the evidence of multiple strikes it is clear that these were a series of single head devices. There may have been more than one device for country offices in Queensland or larger offices such as Melbourne and Sydney. Sydney is known to have used a circa 1912 type RI/CO/LD device between 1912-1967, as well as an RIC device between 1932-1967 and a thicker pin variety of the RI/CO/LD in 1929-1930, so there is evidence to support the theory of multiple devices in the same location. Therefore it is difficult to confirm how many of these circa 1912 devices there were as the patterns from the various devices are so close. Some variation between the patterns from these remote devices is noticeable but is so subtle that it cannot be catalogued. It is worth considering the possibility that the pattern was a result of a single device, most likely located in the Melbourne office, with punctured stamps then distributed to the remote offices. However this is difficult to support given the usage on postage and revenue stamps of various States and the fact that the Company subsequently purchased a similar (RI/CO/LD) pattern device for the Hobart office in about 1930, as well as providing a series of RI/CO devices to the Launceston office between 1920 and 1969 and an RIC device to the Sydney office from 1932-1967. If you had a workable process from a central device then these other devices would not be required. This RI/CO/LD device of Brisbane is found on postage and revenue stamps of Queensland as well as postage stamps of Australia for the period from 1913. Usage on postage stamps for this pattern is reported until as late as 1967. However due to the similarities in the patterns produced by these circa 1912 devices it is difficult to accurately determine when a specific device in a particular location stopped being used. Any closing date would need to be supported by evidence based on issues that the pattern is found on and postmark evidence. This is most likely based on reports of partial strikes of the full circa 1912 RI/CO/LD pattern. We have seen many examples of these patterns and all show evidence of the top of the LD generally in blind pins or in some instances just the outline of part of the pin visible under a microscope. Partial Strike [above] showing 2 blind pins for the top of LD. These partial strikes are not common but they can be found on stamps of most capital cities and over nearly the entire usage period of the circa 1912 RI/CO/LD devices. Given this broad usage and distribution and the fact that they show evidence of the LD means that they are most likely an operator error where insufficient pressure is applied across the entire height of the die head. The 1912 RI/CO/LD devices produce patterns which are near to identical so defining types is not possible. In previous studies the term “type” has been used to describe a number of different forms of variation within a pattern such as, similar pattern images that may be the result of alterations to the die head, a similar die of a multi head device and the variation present in most service punctures. Given that these circa 1912 RI/CO/LD devices were single head devices which produced essentially identical strikes over the life of the devices, the use of the term “type” is not appropriate. The noting of these “types” may have been an attempt to describe the somewhat similar patterns such as RI/CO/LD.b, (detailed below) or the thicker pinned NSW pattern, RI/CO/LD.b (1929-30) of the Sydney office (see NSW listing) or indeed the Tasmanian RI/CO/LD.a (1930-63) of the Hobart office. (see Tasmanian listing). The 'I' of 'R I' is now directly over the centre of the 'o' in Co on line two. KGV 1920 issue 2/-, 10/-. 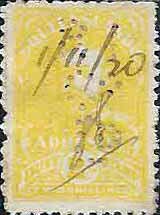 KEDVII 1908 issue 20/- R4. KGV 1920 issue 2/- R4, 10/- R4. 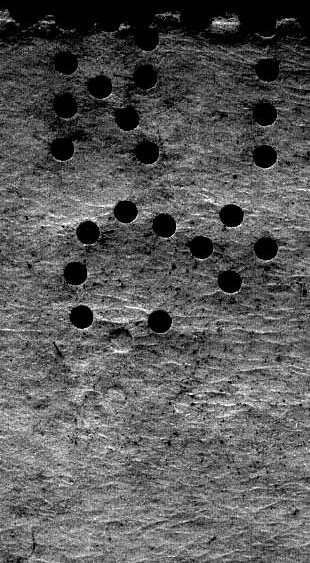 Device: This is a previously unreported pattern and is only found on the revenue stamps of Queensland. It is similar in layout to the RI/CO/LD.a above but the leg of the R is less angled, the R and I are further apart and the L is distinctly larger. This device was short lived and usage centres around 1920. As outlined in RI/CO/LD.a above there may have been more than one RI/CO/LD.a device located in Queensland and this pattern may be the result of a modification of one of these other .a devices. If so it was not a successful modification as the pattern tends to produce incomplete strikes with poor pin penetration. User: Robert Reid & Co.
Revenue Use: KEDVII 1908 issue 2d. Rarity Scale: KEDVII 1908 issue 2d R4. Background: Robert Reid was born in Leven, Scotland, in 1842 and his family migrated to Victoria in 1855. His father died soon after they arrived and Robert, the eldest at just 13, had to support his family. After working as a clerk he spent 17 years with William Watson & Sons,(wholesale warehouse), Swanston Street, before starting his own wholesale drapery in Flinders Lane in 1874, with partners Edward Warne and John Adair. In 1876 the company became Warne & Reid and in 1881 they moved into new premises with a staff of 90. The next year they established a factory in Collingwood with 250 staff to manufacture men's clothing, as well as opening a large Sydney branch. In 1887 Warne retired and the company became Robert Reid & Co. and by 1890 it was one of the largest Australian importing businesses and had additional branches in Adelaide and Brisbane, as well as buying offices in London and Glasgow. In 1898 Reid's became a limited liability company with a capital of £500,000 and its head office was located in a five-storey building in London. Reid was elected to the Legislative Council in 1892 and served until he resigned in 1903. In January 1903, Reid was elected to the Senate but he did not seek re-election and he died in May 1904 of complication of diabetes, while on holiday in England. He was survived by his wife four sons and six daughters. His sons continued the family business and in 1966 Robert Reid & Co. amalgamated with its long-time competitor Paterson, Laing & Bruce to become Patterson, Reid & Bruce. Device: The RR/CO/LTD device is a single head device and is found in the usual range of positions. It was the subject of an approval that was granted in June 1911 and this date is supported by postmark information. 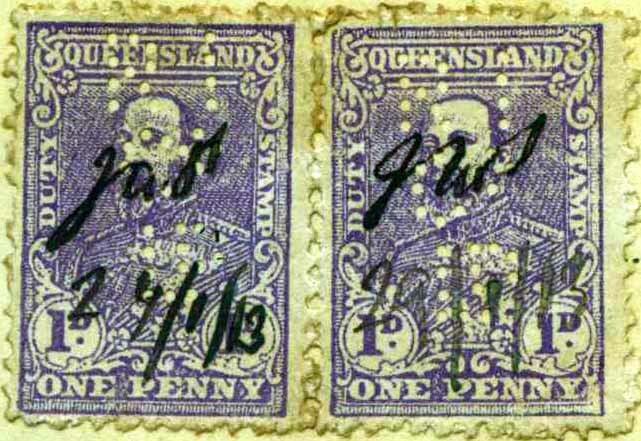 The pattern is found on postage and revenue stamps of Queensland as well as Australian stamps of the Commonwealth period up until 1923. Late usage shows the L almost entirely missing and it may have been this that lead to the discontinuance of the device. Related Patterns: Robert Reid are prolific perfin users in Victoria but these are all on postage stamps and to date none of the Robert Reid patterns of RR, RRC, RR&C, and RR&CO have been reported on revenue stamps of Victoria or other States.